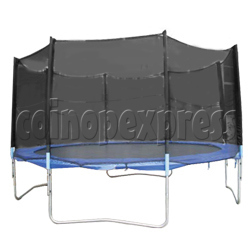 Trampoline(8FT) made by galvanized steel, better stitching, tougher springs and safety pads. It's great size for small yards and younger jumpers. Younger jumpers bounce on trampolines to help them for the health benefits, Also it's most important to get great fun. Round heavy-duty steel frame that will never bend, break, or rust.